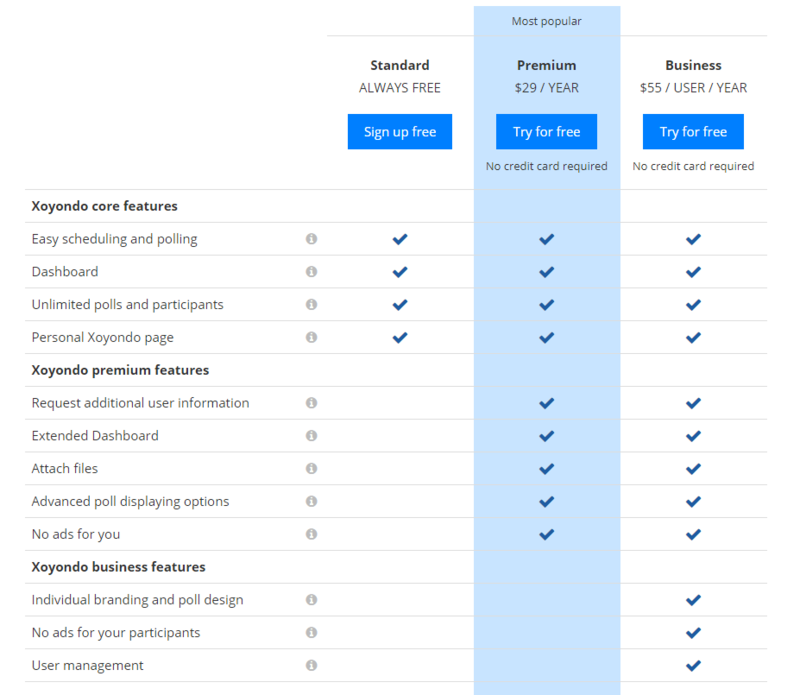 After months of hard work our Xoyondo Premium and Business subscriptions are finally here. While the basic functionality of Xoyondo will always be free (and will continue to improve), our new plans are designed for users that need additional functionality or individual branding. Attaches files to your polls. Request additional information from your users when they vote in a poll. As an example you could ask them for their email address or the phone number when they participate in your poll. Prevent participants from editing their vote. This is useful when you need a definitive choice from each participant so that you can plan ahead. You have access to an extended Dashboard, which allows you to sort all your polls by name, number of participants or last activity. Furthermore your can archive older poll. Advanced displaying options for your polls. You can sort the poll table by each column and display only certain rows. This makes it easy analyse large polls without the need to export them to Excel. You will never see ads on Xoyondo. User Management: Add and remove Business users from a central location. You can assign and remove Business status of your users at any time. Custom design for your polls. Replace the Xoyondo logo with your own logo and adjust the color scheme to your corporate design. You can have multiple designs and assign them to each poll individually. Every design you (as admin Business user) create will be automatically available to your connected Business users. You and the participants in your polls will never see ads on Xoyondo. You can try our new features 30 days free! If you have question or comment, please let us know! Posted on 13. August 2018 Categories AllgemeinLeave a comment on Xoyondo Premium is here! We are happy to announce that our Xoyondo was recently recognized with two major achievements by a leading B2B software review platform. FinancesOnline granted to us the 2017 Great User Experience and Rising Star Awards after their review team tested our features thoroughly and found them delivering excellent results. We are a recipient of The Great User Experience Award for best appointment scheduling software. Tthe review team concluded that we have a very intuitive platform that is easy to use to simplify the task of organizing meetings, scheduling appointments and collaborating with people in different time zones. Our software also features a polling tool that aids in getting feedback from your workforce or various teams. Likewise, we were given the Rising Star Award (won by only best software for small business solutions) for featuring simple but useful tools that the entire organization can quickly set up and use. Our users like the flexibility that Xoyondo affords them; in fact, our tool can be used from simple scenarios like gathering your friends for a lunch-out to complex tasks like setting up a trade fair booth and managing work shifts. You can also utilize Xoyondo’s discussion boards for collecting ideas for an event or project. When you are faced with juggling schedules, whether at home or work, Xoyondo is the perfect fit.